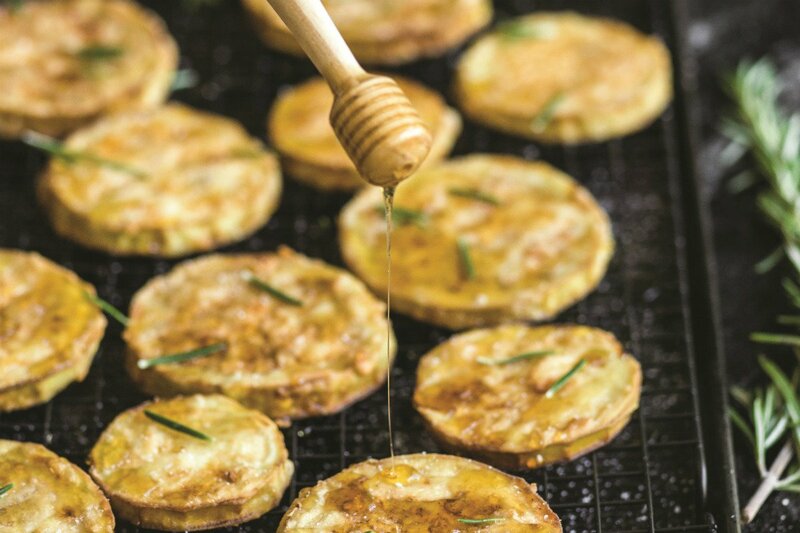 Fried eggplant with honey and rosemary. Photo by Evan Sung. Chef Katie Button grew up visiting Spain with her family, met her Spanish husband while working in a restaurant in Spain, and now owns two restaurants in Asheville, North Carolina — Nightbell, a small plates joint, and Curate, a Spanish tapas-style spot. In other words, Button knows a thing or two about Spanish cuisine. Enough, you might say, to fill a cookbook. Which she did, in the form of Cúrate: Authentic Spanish Food from an American Kitchen. We asked for one of her favorite recipes from the book, and she said "si." Traditionally, this Andalusian dish is served with cane syrup, but I think honey has a more complex flavor. Throughout Spain, there's a range of honey as varied as the landscape. Any type accents the crisp and salty shell of these eggplant rounds. My personal touch here is the rosemary leaves, which bridge the savory bite of eggplant with the sweetness of honey. The salty-sweet crunch of this dish makes it an ideal appetizer. 1. Pour the milk into a medium bowl. Trim the top and bottom of the eggplant, then peel. Cut the eggplant into 3/8-inch-thick slices. As you slice the eggplant, put the slices into the bowl with the milk. You should get about 12 slices, but it's fine to have more or less. The milk should cover the eggplant. If it doesn't, add more. Weigh down the eggplant with a heavy plate that fits snugly over the bowl to keep the eggplant submerged. Cover with plastic wrap and soak overnight in the refrigerator. 2. When ready to cook, fill a large skillet with the vegetable oil. It should be about 1/2 inch deep; if not, add more. Heat the oil over medium heat until an instant-read thermometer registers 350°F. A pinch of flour should sizzle when it hits the oil. 3. Spread the flour on a plate. Drain the eggplant. Dredge a slice in the flour and tap off the excess. Carefully drop into the hot oil. Repeat with more eggplant slices, being careful to not crowd the pan. Fry, turning once, until golden brown, 2 to 3 minutes per side. The eggplant shouldn't get too dark; reduce the heat if needed. Transfer to a wire rack to drain and immediately sprinkle with salt and drizzle with honey. Repeat with the remaining eggplant and flour. 4. Arrange the eggplant on a serving plate. Top each piece with two to three rosemary leaves. Serve immediately. Buy Cúrate: Authentic Spanish Food from an American Kitchen by Katie Button with Genevieve Ko. Excerpted from the book Cúrate: Authentic Spanish Food from an American Kitchen. Copyright © 2016 by Katie Button with Genevieve Ko. Reprinted with permission from Flatiron Books. All rights reserved. Photography by Evan Sung. Katie Button shares her favorite places in Roses, Spain.